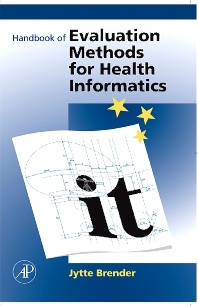 The Handbook of Evaluation Methods for Health Informatics provides a complete compendium of methods for evaluation of IT-based systems and solutions within healthcare. Emphasis is entirely on assessment of the IT-system within its organizational environment. The author provides a coherent and complete assessment of methods addressing interactions with and effects of technology at the organizational, psychological, and social levels. It offers an explanation of the terminology and theoretical foundations underlying the methodological analysis presented here. The author carefully guides the reader through the process of identifying relevant methods corresponding to specific information needs and conditions for carrying out the evaluation study. The Handbook takes a critical view by focusing on assumptions for application, tacit built-in perspectives of the methods as well as their perils and pitfalls. Jytte Brender McNair has an R&D background of fifteen years in a university hospital, nine years as an industrial researcher, and fifteen years as full-time university researcher. Her expertise and experiences cross-fertilise an M.Sc. in biochemistry (Copenhagen University, 1973), an M.Sc. in computer science (Copenhagen University, 1991), and a European Doctorate & PhD in Medical Informatics (Aalborg University, Technology & Science Faculty, 1997). Her most recent position was as full-time researcher at the Department of Health Science and Technology, Aalborg University, Aalborg, Denmark, since October 1995. Her research career had a scientific focus on the theoretical and practical aspects of Quality Management and Technology Assessment that included all aspects of evaluation and quality & risk management, with a range from constructive evaluation (dynamic, self-reflective, purpose-driven and corrective evaluation), to holistic analysis of organisational and behavioural aspects. Her expertise covers the breadth of organisational change and evolution, covers the theoretical aspects of the quality of semantic aspects of medical knowledge, and even further to modelling of the architectural logic of organisations. A computer scientist at the anthropocentric end of the ‘scale’, all things human-centred interest her as does the multifaceted realm of asymmetric abstraction. Prior to the Mereon Matrix book, her major recent publication is a handbook of methods for constructive evaluation of IT-based solutions [Brender 2006], emphasising the hidden aspects of methods, assumptions for application, conjecture on epistemological nature, as well as potential pitfalls and perils leading to bias. It includes a framework for meta-analysis of evaluation studies that is dedicated to pinpointing the downside in such studies, while scrutinizing experimental biases. In August 2011 she took early retirement, becoming a professor emeritus, to focus on applications of the Mereon Matrix as a template for modelling information; see more about the work related to the structure of Mereon on www.mereon.org. Jytte’s interest here is information modelling, striving to understand the internal workings of systems as systems, therein both social and biological systems. Her recent significant contribution is modelling human molecular genetics (including clinical genetics) using the Mereon Matrix as the template information model. In this, she has taken advantage of her original training as a biochemist together with her experience in computer science/health informatics to develop the explanatory model in [Dennis et al. 2013] together with her husband, Peter McNair, and others on the Mereon team. Her professional experience includes project management and technical coordination, over global (project) quality and risk management, to task leader in large multinational, cross-disciplinary R&D projects involving multiple teams of highly skilled academics. She is author/co-author of seven books, 68 publications in scientific peer-reviewed journals and books (about a third of them invited articles), more than 80 technical reports (almost all peer-reviewed) and 75 presentations with proceedings/abstracts (therein 34 invited and 3 keynote presentations). She is (co-)editor of 7 proceedings of international congresses and workshops, including an interactive CD-Rom and one special issue of a scientific journal.